Stoelting began manufacturing frozen dessert equipment back in 1905. Since then, Stoelting has continued to grow and expand their frozen drink and treat equipment to include granita and slushy style machines. 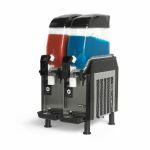 From the cold and sweet to the icy alcoholic, look for a Stoelting unit to provide what you need. Stoelting by Vollrath is located in Kiel, Wisconsin and they provide frozen beverage and treat solutions to foodservice businesses across the United States and in other countries as well.